Fabulous! Funny! Full of great moments! Good grief, at one point the theatre audience clapped along with the players. It's the road runner and the wily coyote, and Julia Roberts is the coyote with a conscience. Okay, so now you know. I liked it. Today more than ever women are making friends with men. Let's say, people are being best friends with members of their gender-of-preference. So what happens when your best friend gets married? It's hard. If they go down that long last walk of singlehood before you do, you have lost something you can't easily replace. Best friend status is about travelling hours to pour coffee in the middle of the night, and hours of shared pain and shared good times. If you can be a best friend, you have a lot. Well, no, you shouldn't compete. But some do, some scoff, some spread gossip, some practice subtle and unsubtle destruction techniques. Neither men nor women are above this. It's about preventing a loss. It's about grieving for a friendship that is about to change permanently. 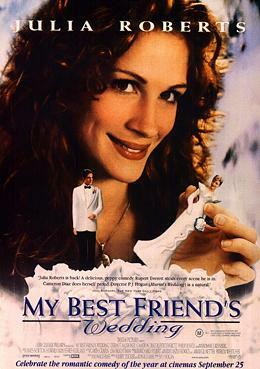 In My Best Friend's Wedding, Julianne (Julia Roberts) is about to lose her long time best friend Michael (Dermot Mulroney) to another woman, Kimmy (Cameron Diaz). The question is, why is she so determined to break them up? Is she suddenly aware of her ex-boyfriend, long-time friend's charms? Or is it that feeling of being left behind, of being left out? But never mind the philosophy, watch the film. It's the road runner and the wily coyote, and Julia Roberts is the coyote with a conscience. Beautiful Kimmy, the object of best friend Michael's desires has likeability, and while we have plenty of sympathy for Julianne we somehow manage to want everyone to find happiness. Especially Julianne's new friend, editor and gay-guy George. In this film George (Rupert Everett) is the out-and-out winner in my humble opinion. He's funny, he's outrageous, he's the voice of reason and the centre of several madcap, over-the-top moments. Julianne may be lousy at long-term romantic commitments, but she has two of the best male friends a lady could have; and rightfully, she appreciates this. And so it all ends happily, they all find happiness in their choices and their futures, and the audience leaves having had a damn good time.